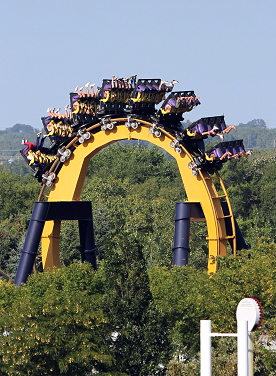 Six Flags Great America in the windy city of Chicago, Illinois is the ultimate family adventure for all ages. With 13 stunning roller coasters that features traditional wooden coasters to twisting metal monsters and over 75 other attractions. Thrill-seekers will enjoy such rides as Dare Devil Dive a 125 ft. free fall ride or Giant Drop. The name says it all. This terrifying 200 ft. drop is a high speed adventure that includes an awesome free fall. Raging Bull is one of the tallest, fastest coasters in the nation and is a clearly a must do at Six Flags Great America. Guests can meet Looney Toon characters and the Justice League and get your picture taken for long lasting memories. Unlimited admission to Six Flags Great America and Hurricane Harbor Includes park admission to Fright Fest Unlimited admission to ALL Six Flags theme parks Includes park admission to Holiday in the Park* Tons of additional SUPERMAN edition benefits. All of the regular Season Pass or Membership benefits Season or Membership Parking for each Gold Pass Holder Extra free friend ticket for Gold Pass Holders on a select day Season or Membership Parking at every Six Flags theme park Includes park admission to Fright Fest Includes park admission to Holiday in the Park* Tons of additional SUPERMAN edition benefits. To view Six Flags Great America Admission Tickets, other Specials and Coupons, go to their special page by clicking here. Six Flags Great America updates this page throughout the year, so check back to see if new specials and coupons have come in. Note to our visitors: Six Flags Great America coupons and specials can change without notice. So please visit their official website to make sure of the latest pricing and coupons.